Why Strictly, and why now? I can answer that one straight away. It’s because it’s the first time they said yes! I’ve been a massive fan of the show for years, and it’s always been my pipe dream, so when anyone has ever asked me which is the one show I would like to do, it was always Strictly. It’s been my dream, and this year it just so happens to have come true. I was a little overwhelmed and shocked when it did. You saw it through to week seven. What did the experience teach you about yourself? It taught me that I’m far more resilient than I give myself credit for. Strictly has been the hardest thing I’ve ever done, both physically and mentally. I’ve got two degrees and work in children’s A&E, but I found it to be physically very demanding. You have to train so hard, and it’s taught me that I can do that. I can train for six hours a day and kind of get through it, but mentally you have to be really resilient. It’s very stressful, and you take on a lot of pressure. It’s about coping with the anxiety which comes with being in the competition. It’s made me realise that just when you think you can’t do any more, you can actually dig deeper and find something. Janette [Manrara, his Strictly dance partner] taught me that, which is why I think we got on so well. She was able to support me through not only the amazing bits, but also the times when I thought I couldn’t do it anymore. Which was your favourite moment? Oh, there were so many, and it’s all such a blur now. I guess one of my most memorable moments was the first dance we did. It was to a Whitney song, and I’m a massive Whitney fan. It was one of my favourite Whitney songs, and we did the Cha Cha. That was the first time I’d ever done a formal dance of any sort. It went really well, and I absolutely loved it. I remember right at the end being completely knackered, as it was a full-on routine, but it was such an incredible buzz. It was so great, and Janette was jumping up and down because it was the first time I’d done that routine without any mistakes. It was a really special feeling that I’ll never forget. What appeals to you most about touring with the rest of the Strictly crew? I miss dancing so much, and I think I’ve become weirdly addicted. I’ve also missed seeing everybody because you become so close, both to the pros and the other celebs. I had kind of been thinking to myself that if I didn’t get on the tour, then I would definitely take up some dance lessons, so when news came through about the tour, I was absolutely blown away. It’s fun. We get to do our dances again with our partners. We get to share all that time with our friends again, and we get to go on the road and meet people who are fans of the show. It’s going to be one big party. It’s all the good things about the show without the stress of learning new routines every week. And because it’s the same show over and over again, you just get better and better and really enjoy it. With the TV show, you have such a short space of time to learn your routine. You learn a brand new style and a brand new routine in a maximum of four days. I was also trying to do all of my other jobs, so I never really got to a point where I could do the dance and just enjoy it. I’m hoping that once I’m on the tour and the dance is in my head, I can just have fun and be myself. That’s what I’m really looking forward to - being able to just enjoy the dancing instead of worrying about which step comes after which. Has your Strictly experience fuelled your desire to do more reality TV, or is that it now? I would never say never. This has been the first reality show that I’ve ever been part of, and it’s been a pretty special one because there’s nothing like it. Probably nothing else will give me as much of a buzz, but we’ll have to see what happens. Regarding your personal life, how old were you when you realised you were gay? I came out later in life. I was about 30. I first had to realise who I really was, and then have the confidence to be myself before I could tell everybody else. It wasn’t the easiest process. Obviously some people come out earlier than that and some people a lot later, but no matter when it is or who it is, it’s not easy for people, and that’s why I’m a massive champion of helping people become who they are and be happy. Was the coming-out experience easier or harder than you anticipated? I didn’t really have any expectation of what it would be like. Growing up, I really didn’t have any friends from the LGBTQ+ community, or any role models. That came later, when I was older. I did then meet and make a lot of friends who were gay. Up until then, I didn’t have any expectations about the community or gay life because I really hadn’t known it. My own experience was quite difficult and quite painful, but I really didn’t have anything to compare it to. It was just what it was. What advice would you give to gay Asians who are on the brink of coming out? Firstly, don’t be afraid to be who you are, because you have just as much right as everybody else to be happy. Secondly, if you need help, there are lots of people around who will help you and catch you afterwards. Finally, no matter how difficult it is, how painful it may be and what you might have to go through to get there, it always gets better. You will be happier for it in the end. For a lot of Gaysian people, it’s a very difficult experience. There are many of us here who’ve been through it, have come out the other side and are much happier as a result. 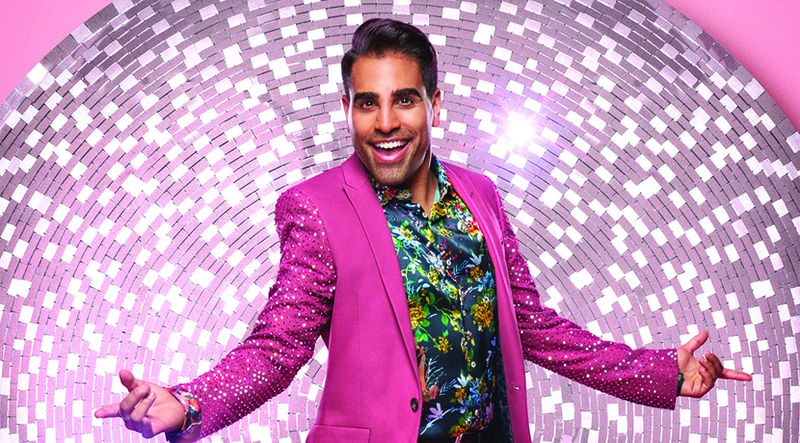 Dr Ranj joins the Strictly crew when it stops off at Arena Birmingham from Fri 18 to Mon 21 January.